The stories of the weekend were centered around absences and appearances. The absences were Courtney Force and Tony Schumacher. Courtney has stepped away from driving on her own volition and Tony is waiting for DSR to finish up a a sponsorship deal on his top fuel dragster so they can get back out on the road. The appearances end of things had names like Frank Pedregon who had last raced in 2006 on the strip and most impressively it had Austin Prock, son of Jimmy Prock making his top fuel debut. 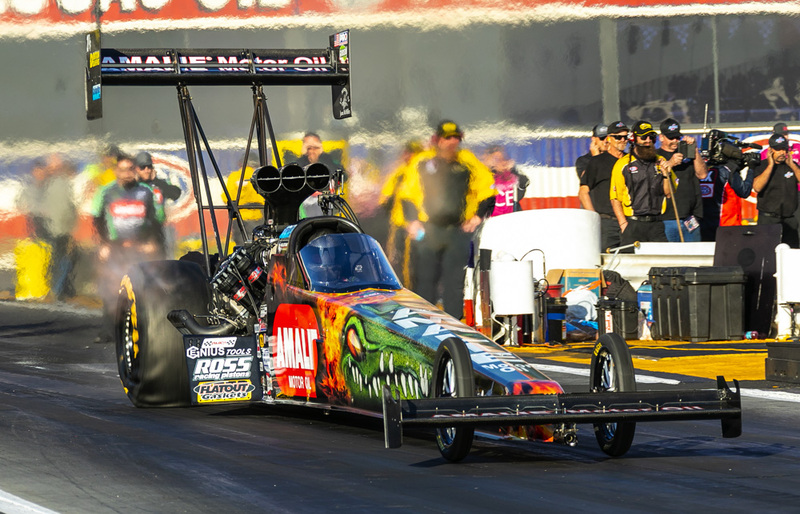 Driving his car expertly all weekend long, his crowning moment in a John Force Racing top fuel car came in round one with a pedal job and a great hunk of driving to get his car hauled down from 312mph with no parachutes. We’ll be back with more Pomona photos tomorrow!